For as long as coatings have been around there have been specialized products meant to work with them. Everything from coating maintenance shampoos, clay bars, glazes, and of course toppers. Toppers are used to add protection on top of the coating layer to help maintain hydrophobic properties and enhance gloss. Most of these products also work quite well on uncoated vehicles as a stand alone layer of protection as well. 22ple already has VS1 Final Coat which is a spray sealant, but they have recently added 22ple Finitura to their product line as another option for paint protection. Finitura is a unique top coating that can also be used as a stand-alone protection product. As a stand-alone product, Finitura will provide a deep, wet, glossy, sleek finish, that repels moisture with ease. 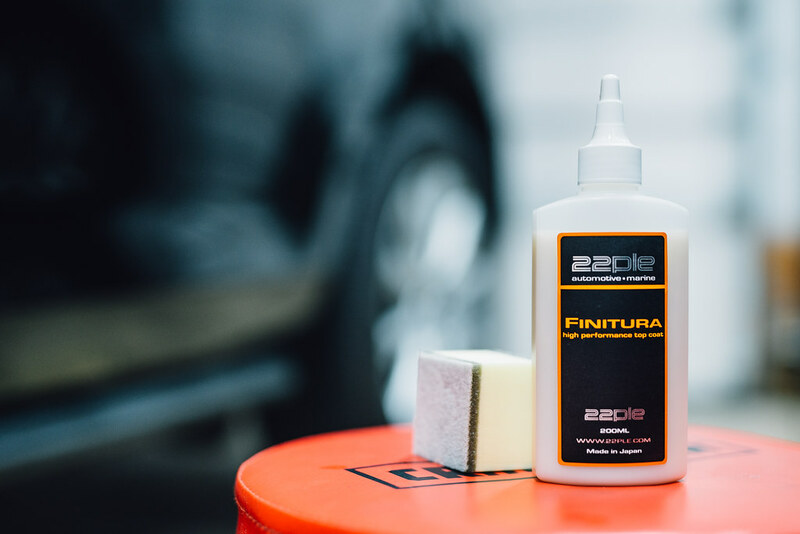 If you already protected your car with a coating Finitura can be applied directly on top of it and it really enhances that protection. 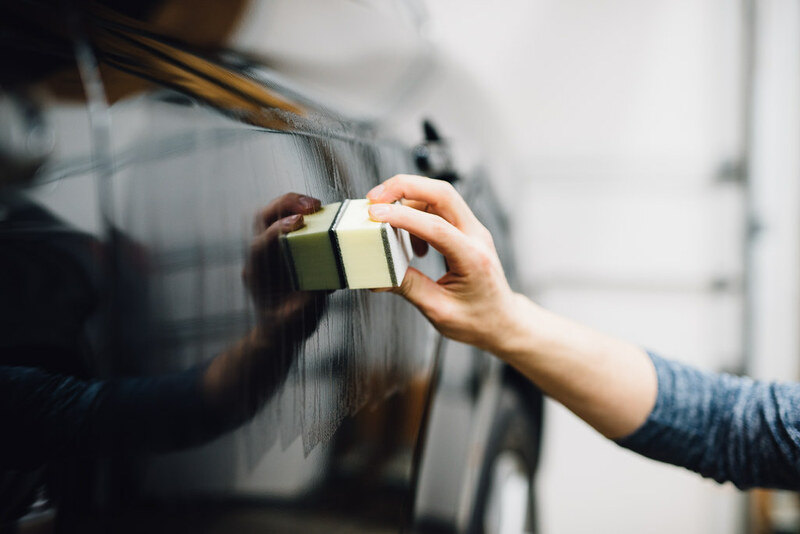 You will not only see the same increased gloss, hydrophobic and protective properties but according to 22ple, Finitura will improve scratch resistance on glass coatings by over 500%. If you keep getting watermarks this is an absolute must have product as it will repel them incredibly well! The application is super easy so you get great results in very little time. With an economical and easy to use formula, we can not think of a reason not to give Finitura a try! 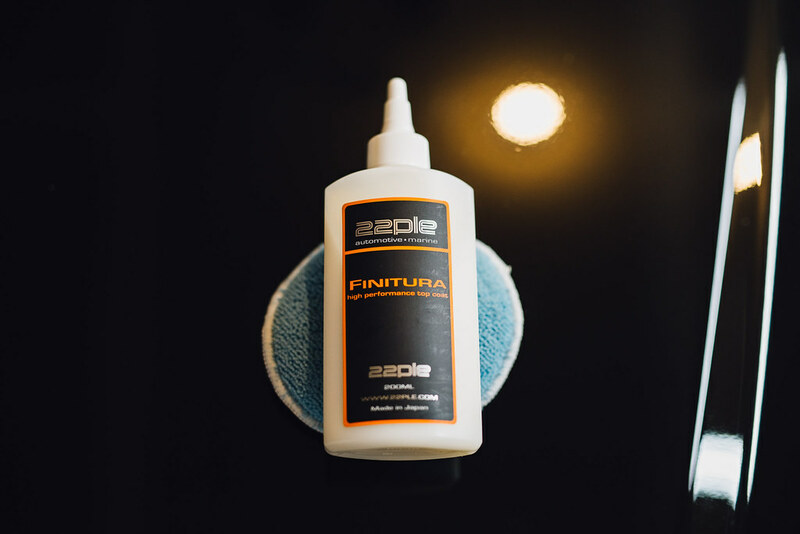 Before applying Finitura, it is very important to make sure you have a very clean surface. 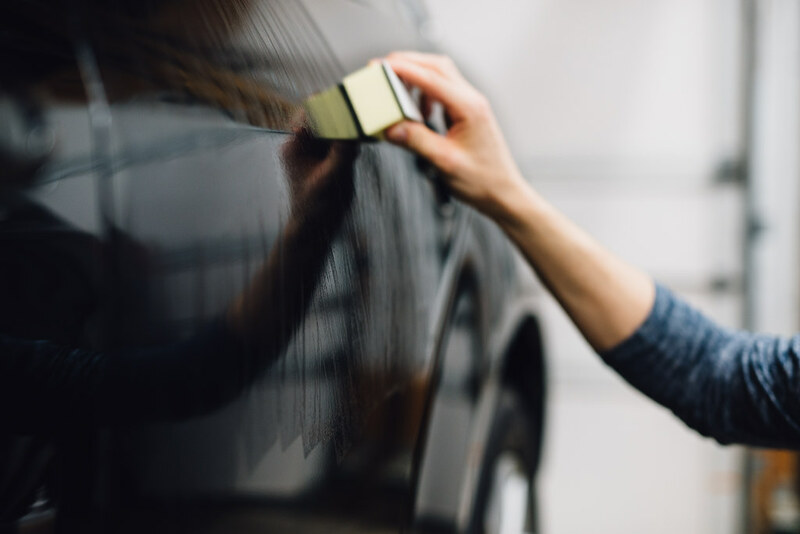 If applying as a stand-alone protection on an uncoated vehicle, it is best to first polish or perform any necessary paint correction work if desired. 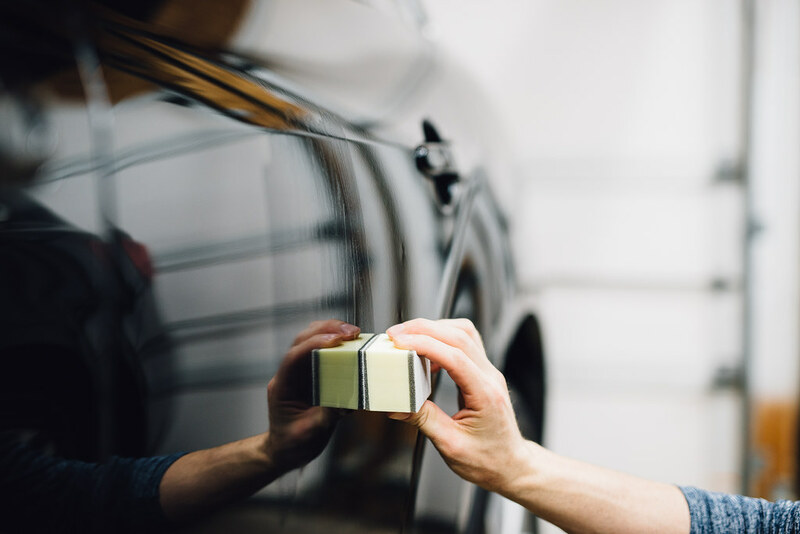 Next, wipe with a prep solvent such as isopropyl alcohol to remove any polishing oils or use a primer polish and then apply Finitura without using a prep solvent. 22ple recommends using their 22ple Activate primer polish as a great base layer for one of their glass coatings or for Finitura. If you are applying Finitura over a paint coating it may be applied to a brand new coating or to a previously applied coating. 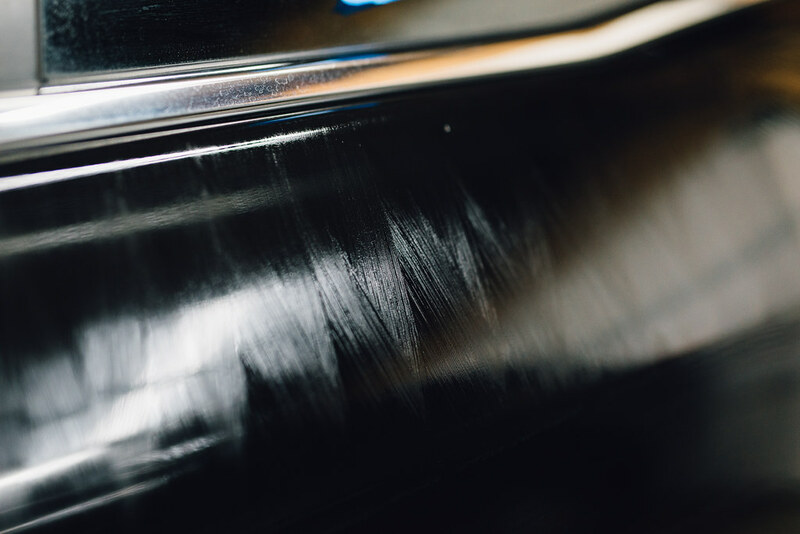 For new coatings, allow 6-8 hours for the coating to cure before applying Finitura. For my testing, I first polished the panel and then wiped thoroughly with Gyeon Prep to ensure I had a perfectly clean panel. I applied a small amount of Finitura to the 22ple applicator block and began to spread the product onto the panel using an up-and-down motion. Finitura has a water-like consistency which made it difficult to pour only a small amount out of the dispenser bottle. I feel like perhaps a spray bottle would be easier to work with and allow for more accurate dispensing of the product. I continued applying the product onto the paint using overlapping passes to ensure even coverage. The small amount of product spread for quite a while and allowed me to cover approximately one half of a door before I needed to add some more product. The product was easily visible immediately after application. The detailed image product page recommends to apply Finitura nice and thin, and although I attempted to really spread this product out I was afraid I had applied it too heavily at this point as it appeared quite wet. The manufacturer claims that wipe off time is very flexible and can range from as little as 1 minute to as much as 20 minutes. Given that I was working on a very humid day (it was actually storming outside as I was working), I first attempted to wipe off after about 3 minutes, and on a subsequent panel even tried to wipe off immediately after application (~1 minute). At this time the product was already very difficult to wipe away for me and felt like some old school wax residue that had been left for too long and required some “elbow grease” to remove. After working to remove the majority of the residue, an LED inspection light revealed a lot of thin oily residue still remaining on the surface. A damp microfiber towel helped to remove the remaining residue. The treated surface felt slick and was noticeably darker than the untreated areas around it. Since my first test spot require far more work than I had anticipated with regards to the residue removal, I decided to wait until the next morning and then try another application method. I’ve never been the biggest fan of the 22ple Applicator Block, so I decided to try a microfiber applicator instead. I applied a small amount of Finitura to the face of the pad and then began to spread the product onto the panel in the same fashion I had done before. This time the product seemed to melt right into the paint after a short time, leaving very little wet spots on the panel. This was already a very different experience from the night before. With lower humidity and far less residue on the surface I felt more comfortable leaving the product alone for longer before wiping it away. I left it to sit for approximately 10 minutes and then easily wiped away the residual product. Upon inspecting with an LED light only very faint residue remained, which I’ve noticed is quite common for many coating toppers. On this second test panel I again noted a darker, slick feeling finish. It was raining the day after application, so I was eager to observe the hydrophobic properties as I have always been pleased with the water behavior of 22ple coatings and with VS1 in the past. Unfortunately Finitura left a lot to be desired here. I had been expecting uniform, tall, round beads, however they were irregular and rather flat. It is claimed that Finitura can produce a 500% more scratch resistant surface, though I had no way of testing this claim. 22ple also mentions that Finitura offers great resistance to water spotting, a common complaint with glass coatings, so I will be monitoring the treated panels over time to observe if spots are formed. There has been no mention of durability in the product information that I have seen. 22ple Finitura was not particularly remarkable to me. With many other great coating toppers out there to compare with, Finitura required considerably more effort without producing favorable results. At $85 per bottle ($12.57 per ounce) this is by far the most expensive coating topper out there as well. The product needed to really wow me to justify the price point, but it has not so far. In an attempt to try to maximize my results with this product, I have asked for more clarification on use instructions to see if my experiences may have somehow been a result of user error. I have not received any feedback at this time. I will be sure to update everyone in the comments below if further instruction and testing change my opinions shared in this article . Its an interesting and yet somewhat puzzling product I’ve had great success with 22ple coatings and was quite excited when Finitura finally became available after over a year of occasionally hearing it mentioned. Upon receipt immediately after appearing on DI site, I quickly gave it a try and the limited mfg advice kinda seemed almost as if they were a little unsure as well. They recommended spraying into a microfiber despite it not having a spray top, left the removal window (between 1 minute and 20?) up to conjecture and really offered no other concrete recommendations. I first used it as a stand alone on a polished/prepped surface and it really wasn’t bad…until I looked closely with a light. Indeed, there was a very slight haze that was somewhat tough to completely remove. Not tough in the sense of aggressive effort but quite the opposite…it required very, very light wiping with an absolutely clean towel, changed often, to get to a totally clean surface. The next vehicle I did with 22ple HPC I finished off with Finitura, again running into the difficulty in removing that last little bit of haze. In that case, I had screwed a spray top on the Finitura so I could spray into a microfiber towel and apply in that manner. Easier application but removal was the same. I still don’t really know what to make of this product, but not sure it’s worth the trouble. The claim of 500% greater scratch resistance is a big draw but it’s certainly not in the easy to use category. I used it again on a refresh of a 22ple application (after claying with the 22ple glasscoat clay, which did work quite nicely) after about 20k miles and it *seemed* a bit easier to use. I dunno…I wish 22ple had a bit more presence and involvement in the consumer area as their coatings are some of the best, and easiest, I’ve used but to be honest, Finitura puzzles me enough that I probably won’t purchase again should my current bottle ever run out. I’ll use it on occasion but unless 22ple comes out with some more definitive instructions/documentation it’ll likely be a one time purchase. Even after nearly a year of being available, your post us really the first extensive mention of it I’ve run across. I’ve read several comments regarding Finitura and it seems the most favorable ones are in the colder months of the year. Could there be something related to temperature or humidity ? Dunno, I used it in a 55 degree warehouse and it took a lot to remove that last little bit of oily haze. I will certainly give it some more attention once our midwest heat and humidity start to dissapear. Thanks for the comments! Thank you Zach for your candid comments and honest impressions of the product. Kudos to Detailed Image as well for posting your commentary. It’s very refreshing to read an honest opinion as opposed to purely product marketing for the purpose of sales. Thank you! You’re very welcome. For what it is worth, Detailed Image has always encouraged us to write honest reviews… it just so happens that it is much more likely that I will write about a product that I love versus a product that I don’t, so the majority of my reviews to do be quite favorable for that reason. I‘m a hobbyist…only work on my own cars. What do you think is the best coating product for windshields? Excelente post . Una pena que el producto no da losresultados esperados . Siempre me gusta leer tus post por que siempre se aprende mucho de ellos . Nunca dejes de hacer tusbpost . Interesting post and a great guide for at auto detailing Hamilton MT. Thanks for posting such useful article. Has there been any update on this product? I’m having 22PLE coating applied to my car in a few weeks and am debating on whether or not to have Finitura applied. My main concern is the water spotting. My car is parked under a carport and I’m concerned about getting water spots if it’s raining and I pull in and can’t blow them off immediately. Will I get water spots if the car dries from the rain and it doesn’t get washed in day a week? I’m no pro and perhaps your rain is different than ours but i coated a new fleet van in March 2017 and it ran for 9 months, 25k miles with no washing, sitting outside 24/7 and had no permanent water spot issues. Most of the time, even with no maintenance or attention it stayed remarkably clean and glossy. After the first 9 months, 25k miles I did decon and apply Finitura and its piled up another 25k miles since then, still doing great. I’m doing another vehicle with 22ple VX2 Pro soon and pondered Finitura but decided to skip it. The 22ple VS1 Final Coat is a very nice topper/maint product so I’d just go with that. I’ve tried about 25 or so coatings in the last 2+ years, many on vehicles I see every day that see limited maintenance, if any. 22ple continues to impress…its one tough hombre and excels at self cleaning. I’d skip the Finitura but as with anything like this, YMMV. Thanks KF. 22PLE recommends applying Finitura every 3-4 months to help maintain the coating. I did purchase a bottle of the Finitura and the VS1 so we will see how it goes. Thanks for the write up Zach. I have VX Pro2 on my dad’s car and picked up Finitura to give it a try. For one it is indeed slick. I did not have any issues with application. But for me I should have not topped VX Pro2 with Finitura. The water behavior of Finitura is underwhelming. As you mentioned flat and irregular. It seems to be more of a sheeting type form of protection. I personally won’t be using it again as it took away from the very nice water behavior of VX Pro2. VS1 is a better maintenance product. If I could chemically strip it I would but I will have to just let it wear off over the next few months to hopefully have the performance of VX Pro2 back.